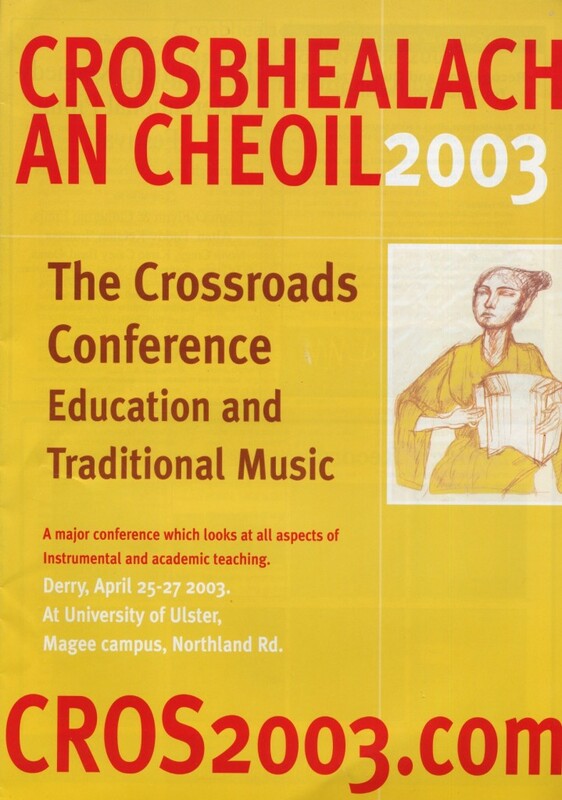 This was held at the Magee campus of University of Ulster, Derry City, Northern Ireland on 25–27 April, 2003. It was hosted by UU’s Irish Studies section, The Academy for Irish Cultural Heritages and it dealt with the assessment and provision of Traditional music education at all levels from the practical to the academic, throughout the island of Ireland and abroad. While the concern and focus was on Irish Traditional music, the nature of investigation was comparative, an interchange of ideas and methodologies, which took in various other European–style Folk / Traditional musics as well – those of Norway, Scotland, Isle of Man, Northern England, Newfoundland, Mid West USA and Brittany. The papers addressed group and one–to–one instrumental teaching of children in organised classes, summer schools and seasonal workshops, the specialised and well–established music schools and third–level teaching; it also covered teaching via tutor books, CD–ROMs, CD, videos and the internet. (iii) teaching for the future: methodologies that have been successful, pedagogy, failures, satisfaction, why do we teach music, problems in teaching singing, training the teachers. All speakers agreed to contribute to the publication of papers. This has not been possible until 2013 for a variety of reasons, but funding was retained for this purpose and this volume now both fulfils the commitment and provides an exceptional fund of information for the benefit of education in this sector. A feature of the conference was a concert performance by young musicians and singers from local (Northern) counties who are the visible beneficiaries of several strands of the instrumental and singing teaching programmes which exist today. All were high quality players, many of them award winners. Local Traditional singer and BBC presenter Brian Mullen hosted this event which was open to the public as well as conference delegates. Such concentrated and structured exposure to the result of practical music education strategies/practices was a hugely–informative ‘first’ for many of the delegates. The Verbal Arts Centre was chosen for this performance, a superb acoustic venue, the use of which took the conference out of the university into local cultural life, as well as introducing conference delegates to the architectural and historical features of the host city. The evening concert at the Verbal Arts Centre featured 22 young musicians and singers from Armagh, Belfast, Tyrone and Fermanagh; all of them had been taught music in modern contexts. They were presented in a manner which illustrated three major transmission methods: dedicated teaching in organised classes, local influence and peer learning and the challenge of professional role models. On each of the conference’s three nights, a dedicated, club–style venue offered conference delegates the facility of casual performance of, and listening to, music and song, in the environment of further debate and discussion. Some thirty of the delegates played music and sang at these nights, making live music making a key feature of the experience of the conference. Thirty–six papers and presentations were offered, some in parallel sessions in two spaces within the venue. There were ten invited speakers in addition to the two keynote speakers. These and the 24 others were chosen to provide the maximum representation of the experience of teaching Traditional musics today. Keynote addresses were by Philip Bohlman (University of Chicago, author of The Study of Folk Music in the Modern World) and Caoimhín Mac Aoidh (Donegal, fiddle–music teaching pioneer, founder of Cairdeas na bhFidiléirí, author of Between the Jigs and the Reels). A display of ‘poster’–style presentations offered visible summations of activity by private, public and summer schools, colleges, etc., involved in the music. Debate was arranged in twelve thematically–focused sessions, involving thirty four floor papers from Irish and international speakers. Fifteen of the papers were from the South of Ireland, six were from the USA, five from Northern Ireland, four from Scotland, two from Norway and one each from Canada, England, the Isle of Man and France. 150 delegates were present on the opening night, and the level of participation at any moment on the debating days was between 90 and 100. Delegates came from Ireland, Northern Ireland, England, Scotland, USA, Sweden, Israel, France and Canada. They represented academic interests (university and teacher training, post–graduate research), Traditional music (instrumental teaching, grades, competition, presentation and performance) and school music teaching. Eight bursaries for Cros ’03 were offered to students of Traditional musics in Ireland, Britain and Scotland. The object of these was to encourage further study of Traditional musics by introducing students to the intensity and depth of debate at an academic conference covering a field normally experienced only at the level of music making. The bursaries were made possible by some of the funders: The British Academy and Critical Voices (Ireland). The recipients were: Brian Keenan, School of Music, University of Ulster, Jordanstown, Belfast, Northern Ireland; Claire Gullan, Royal Scottish Academy of Music and Drama, Glasgow University; Ben Hudson, University of Newcastle Upon Tyne, England; Nicola Morrison, Lews Castle College, Isle of Benbecula, W. Scotland; Cinzia Curtis [Yates], studying at Irish World Music Centre (IWMC) University of Limerick; Teresa Kavanagh, Northern Rhythms Programme, Falcarragh, Co. Donegal; Dominic Mac Giolla Bhríde, Dublin Institute of Technology Conservatory of Music and Drama; Edel McLaughlin, University College Cork. From November 2002 an extensive website – cros2003.com – provided the initial call for papers and also ongoing full and updated information on the development of the conference. Summary and follow–up information is now posted on imusic.ie. Promotion and interviews in the major presses, specialist magazines and on specialist radio programming both on the island and, via internet, globally, provided a wider awareness of the event; specialised discussion sites also carried regular updates. A pre–conference printed brochure distributed at music events in the spring provided basic information and programme details. The paper titles and summaries of all papers presented, background information and biographies of speakers, were provided on a printed conference programme distributed to all delegates. This document (c. 20,000 words) is still available from whinstone.net for a nominal postal charge. Programmes, posters and data from the 1996 conference titled ‘Tradition and Change in Irish Traditional Music’ are also available from the same address. Fintan Vallely (Secretary). Flute player, researcher and writer, Academy for Irish Cultural Heritages, University of Ulster; later lecturer at Dundalk Institute of Technology and Trinity College, Dublin. Liz Doherty (Chair). Professional musician, fiddle player, lecturer and researcher; formerly lecturer in Traditional music at University College Cork; later lecturer at University of Ulster. Thérèse Smith. Lecturer, researcher, writer, University College, Dublin; later Associate Professor in the School of Music, UCD. Paul McGettrick. Flute player, lecturer, researcher in music technology and Irish Traditional music, Dundalk Institute of Technology. Desi Wilkinson. Flute, fiddle and bagpipes player, singer; lecturer, Mary Immaculate College, Limerick; professional musician & researcher; later lecturer in Irish Traditional music and music performance at University of Newcastle. Colette Moloney (Treasurer). Researcher, writer and lecturer in Irish Traditional music, Department of Applied Arts, Waterford Institute of Technology; later Assistant Registrar at WIT. The conference organisation was facilitated by the Academy for Irish Cultural Heritages at University of Ulster which, under the direction of its lecturer Fintan Vallely, hosted the bulk of the event’s services. It was facilitated also by participation of personnel from the School of Music at University College Dublin, the Department of Applied Arts at Waterford Institute of Technology, and the Department of Humanities at Dundalk Institute of Technology. It benefited greatly from the unwaged contribution of the independent committee members – Liz Doherty, Eithne Vallely and Desi Wilkinson. The event was financed (in order of scale) by Awards For All – Arts Council of Northern Ireland, The British Academy, The Irish Music Rights Organisation, Dundalk Institute of Technology and Critical Voices (Arts Council of Ireland). Substantial on–site facilities and organisational work was provided by the Magee campus of University of Ulster, and promotional work, poster and design were contributed by Irish Music magazine. The conference logo – The Blue Kimono – was provided gratis by artist Brian Bourke; artist JB Vallely contributed a valuable print for the fund–raising ballot to which instrument maker Malachy Kearns of Galway also donated a specially designed bodhrán; the reception and night time facilities were courtesy of Sandino’s Café Bar, Derry City. The economic equivalence of the considerable voluntary work of the organising committee members is also acknowledged. Anderson, Alistair. Bringing Traditional music to the university: Traditional music degree teaching in Newcastle On Tyne. ENGLAND. Bennett, Margaret. Understanding the heart and soul: more than just notes. Teaching cultural context of Traditional music & song. SCOTLAND. Bohlman, Philip. Top–down, inside–out, in–between . . . global directions to the crossroads: Traditional music ‘paradox’, revival, globalisation. USA. Burgess, Barry. Back to the future: Traditional music in a 21st century curriculum. Northern IRELAND. Claudy, Frank. The challenge of meaningful group teaching at Irish festivals and summer schools: lessons from adult learning theory. Corcoran Seán. Canons, curricula and power in Irish music: who decides what should be taught? IRELAND. Coyne, Michael. Teaching the uilleann pipes: the efficacy of specialist teaching in the climate of revival. IRELAND. Cranitch, Matt. Learning & teaching ‘outside the tradition’: problems which arise when teacher or pupil is from ‘outside’. IRELAND. Crépillon, Pierre. Teaching the teachers: teaching Traditional music in the academy. BRITTANY. Devlin Trew, Johanne. Rules of engagement: Traditional music and music education in Newfoundland. CANADA. Dillane, Aileen. Ethnomusicology theory and practice: what it has to offer the study of Irish music. IRELAND. Dowling, Martin. Arts Council approaches to Traditional music education in Northern Ireland. IRELAND. Harbison, Janet. Ancient, diverse and still evolving: the Irish harp today, a solution respecting its diverse repertoires and styles. IRELAND. MacAoidh, Caoimhín. The blood red tear and the hidden note: education, learning and wisdom. IRELAND. MacMathúna, Séamus, with Ní Chonaráin, Siobhán. Teaching: the Comhaltas Ceoltóirí Éireann experience. IRELAND. Marshalsay, Karen. A hotbed of learning: handing on tradition by electronic dissemination in a networked resource at RSAMD. SCOTLAND. McCann, Anthony. Questioning educational strategies: challenges of radical pedagogy in discussion of Irish Traditional culture. IRELAND. McCarthy, Marie. The confluence of school music and Traditional music in Ireland: historical perspectives. contemporary practices. IRELAND. McGettrick, Paul. Third–level education in Irish Traditional music: challenges, opportunities and the impact of technology. IRELAND. Mercier, Mel. Irish Traditional music and the university: the potential offered by exploration of cross–disciplinary shifts. IRELAND. Miller, Jo. Issues in teaching Traditional music at the royal Scottish Academy of Music and Drama. SCOTLAND. Moloney, Colette. Grades as inspiration to learning and as a method of assessment. IRELAND [not available]. Moulden, John. The Irish Traditional Song Pack: a response to the difficulties inherent in using Traditional song in schools. IRELAND. Munnelly, Tom. When learning went round in song: some observations from the field. IRELAND – p.40. Newton, Bob. What’s in a name? Teaching musical traditions of the Celtic world: questions, challenges and classroom responses. USA. Ni Chonaráin, Siobhán, with Séamus MacMathúna. Teaching: the Comhaltas Ceoltóirí Éireann experience. IRELAND. Nyvold, Frode. Folklore and music as integrated artistic expression: preserving contexts for Folk in the academy. NORWAY. O’Brien Moran, Jimmy. Session Tonight. All are Welcome (must have grade 5 or over): questioning examination and institutionalisation in Traditional music. IRELAND [not available]. Ó Gráda, Conal. Teaching of Irish Traditional music via the internet and the Scoiltrad initiative. IRELAND . Ó Rócháin, Muiris. Appealing to the national and international: the development of Scoil Samhraidh Willie Clancy. IRELAND. Reeves, Stan. Re–building community with music: Traditional music in adult education/community development in Edinburgh. SCOTLAND. Slominski, Tes. Role model, group and organisation: the value of role models and governmental and local support to a music community. USA. Sommers Smith, Sally K. When do we get to The Clancy Brothers? Teaching Irish Traditional music in an American liberal arts college. USA. Stubseid, Gunnar. Fiddling education: problems and successes of the Folk in the academy. NORWAY. Taylor, Barry. From flag floor to concert platform: passing on the tradition. 20th century learning/teaching methods. IRELAND. Vallely, Eithne. Teaching practice, publication and innovation in thirty–seven years of Armagh Pipers’ Club. IRELAND. Yates–Curtis, Cinzia. A case study in Traditional music teaching on the Isle Of Man: the teaching methods of Mike Boulton. ISLE OF MAN. These are updated, and are different in many cases to those which appeared in the original programme. All of the individuals are cited also in other publications and on organisational, college and personal websites which can be consulted for additional information. Many of the people named here are also contributors to, and/or are dealt with in biographies or in indexed entries in the 2011 paper and digital editions of Companion to Irish Traditional Music. Alistair Anderson has been at the forefront of Traditional music in Britain since the early 1970s. A touring soloist, he has done countless European tours, thirty–seven in the USA and five in Australia. Internationally acknowledged as the master of the English Concertina, he is also a fine exponent of the Northumbrian Pipes. His passionate belief that Traditional music has an important place in contemporary society has led him to find ways to excite a new generation of musicians, singers and dancers. Huge energy has been put into this work through Folkworks, which he founded in 1986, followed by the Folk music degree at Newcastle University which he launched in 2001. The success of his varied performance and composition work grows out of his deep understanding of Traditional music, balanced with an adventurous sense of its constantly changing nature and creative potential. He is currently working on a new work commissioned to celebrate the Lindisfarne Gospels which return to the north east in 2013. Anderson retains close links with the Folk music degree and sits on the board of both The Sage, Gateshead and The English Folk Song and Dance Society. He performs both with his own band and as a soloist. Margaret Bennett is a folklorist, writer, singer and broadcaster. Her family was Gaelic on her mother’s side (from Skye) and Lowland Scots on her father’s. Her school years were spent in Skye, Lewis and Shetland before she moved to further education in Glasgow. In the mid–1960s the legendary singer, poet, folklorist and political activist Hamish Henderson inspired her career choice. In 1968 she emigrated to Canada to study Folklore at Memorial University of Newfoundland, after which she spent a year in Quebec as a folklorist for Canada’s Museum of Civilisation. From 1984 to 1996 she lectured at The University of Edinburgh’s School of Scottish Studies and she now teaches part–time at the Royal Conservatoire of Scotland. A prize–winning author, she has written ten books and contributed to over forty others and has featured in media productions and several music collaborations with her son, Martyn Bennett (1971–2005), including the National Theatre of Scotland’s acclaimed Black Watch. The recipient of various awards for contributions to literature, folklore and culture, she most recently received an Honorary Doctorate of Music from the University of Glasgow in 2010, was awarded ‘Le Prix du Québec’ for contributions to Quebec cultural studies in 2011 and was made an Honorary Professor of the Royal Scottish Academy in 2012. Philip V. Bohlman is the Mary Werkman Distinguished Service Professor of Music at the University of Chicago and Honorarprofessor at the Hochschule für Musik, Theater und Medien Hannover. He is active also as a performer, serving as the Artistic Director of the “New Budapest Orpheum Society,” which has recorded three CDs, most recently Jewish Cabaret in Exile (Cedille Records 2009). He has published widely, most recently Focus: Music, Nationalism, and the Making of the New Europe (Routledge 2011), Balkan Epic: Song, History, Modernity (Scarecrow 2012, co–edited with Nada Petković), Revival and Reconciliation: Sacred Music in the Making of European Modernity (Scarecrow 2013), and Hanns Eisler (1898–1962) – In der Musik ist es anders (Hentrich & Hentrich 2012, co–authored with Andrea Bohlman). He has received the Edward Dent Medal from the Royal Music Association, the Berlin prize from the American Academy, and the Derek Allen prize from the British Academy. For his performances with Christine Bohlman he received the Donald Tovey Memorial prize, and for performances with the New Budapest Orpheum Society the 2011 Noah Greenberg Award. Philip Bohlman is a Fellow of the American Academy of Arts and Sciences and a Corresponding Fellow of the British Academy. Barry Burgess is a Lecturer in Music Education at the University of Ulster, Coleraine, course co–ordinator for Initial Teacher Education, and course director of the PGCE in Music Education. A teacher at second level for 22 years, he has been in university education since 1990, firstly in the music department at Jordanstown where he developed a module on Irish Traditional music for the BMus degree course and latterly in the School of Education at Coleraine. He was a member of the ministerial working group set up by the Department of Education to write the Proposals for Music in the Northern Ireland Curriculum and has held external examinerships in Belfast, Limerick and Dublin. He has had a long–term commitment to Irish music in the educational curriculum in Northern Ireland since he was a research fellow at Magee College in 1975 producing materials for primary school called Bua an Cheoil. He contributed to Cros ’96 with a paper: ‘Irish Music in Education – a Northern Ireland Perspective’ and also to The Journal of Music in Ireland, July/August 2001. Frank Claudy is a flute and tin whistle player from Washington, DC. A family physician, his work has prominently included musicians’ performance–related problems. He also holds a Masters Degree in Business Administration, and his position as vice president of medical affairs at a large US hospital has afforded him many opportunities to test theories of group behavior and adult learning. He was on the teaching staff at the annual Catskills Irish Arts Week in East Durham, New York from 2003–2010 and in 2010 he brought out a CD of selections from the O’Neill collections: The Pretty Blue Seagull, with guitarist Paul de Grae, flute player Joe Skelton, flute and whistle player Anne Skelton and singer and dancer Patrick O’Dea. He plays céilís and local festivals with piper Jon Cooper, singer–guitarist Keith Reins and fiddler Guy Drollinger as The Quad Cities Céilí Band and, later, The Big River Reeltime Band. Professionally, he worked with the Genesis Health System in the Quad–Cities of Iowa and Illinois. He went on to become Vice President of Medical Affairs for five of Genesis’ hospitals before taking up a position in 2011 as their Physician Advisor in which he specialises in government insurance issues with regard to hospital admissions. Seán Corcoran is a singer, musician, performer, vernacular musicologist, third–level lecturer in Irish Music and Ethnomusicology, broadcaster and filmmaker, festival director and curator. His pioneering fieldwork since the late 1960s constitutes an ethnography of performance of the widest range of Irish vernacular genres from instrumental dance music and song, both in Irish and Hiberno–English, to dance, drama and Lambeg drumming. An unapologetic interventionist on behalf of ‘unofficial’ music, he was a founder and director of both The Tradition Club, Dublin (a trail–blazing platform for vernacular performance which ran for over twenty years in the 1970s and ’80s) and the seminal festival series Féile na Bóinne (Festival of the Boyne) over the same period. He combines scholarly research with media production. His three–part benchmark TV documentary series for TG4, Na Bailitheoirí Ceoil, on the 19th century collectors of Irish Music has been widely acclaimed, and his recent work includes a series of radio documentaries with accompanying websites sponsored by the Broadcasting Authority of Ireland. Mick Coyne comes from a well known Traditional music family associated with the Liverpool céilí band, with which his father Eamonn, from Co Roscommon, played fiddle. Mick began playing on tin whistle when twelve, moving on to flute and pipes, and by sixteen was a regular in the band. His first set of pipes and piping lessons came from Co. Clare piper Tommy McCarthy, and on moving to Dublin his friendship with the great ‘tight’ uilleann piper Andy Conroy laid the foundation for the style of piping Mick exhibits today. He has played at most of the major international festivals, and in 1990 he won the Oireachtas Uilleann Pipes competition. A teacher for a solo–piping class at the Willie Clancy summer school annually, he has taught throughout Europe, and in Canada established a Traditional music programme for Courtney College of Music in Vancouver. He grades piping scholarships granted by Na Píobairí Uilleann, and gives piping tuition at University of Limerick. He is the administrator of the weekly Ennis Uilleann Pipers club, and his solo CD is Both sides of the Coyne. Matt Cranitch is renowned as a fiddle–player and teacher at home in Ireland and abroad. He has performed extensively at concerts and festivals, on radio and television, and has presented many lectures and master–classes. He has won All–Ireland Fleadh Cheoil titles, as well as The Fiddler of Dooney and Oireachtas Crotty Cup. Author of The Irish Fiddle Book, first published in 1988 and now in its fourth edition, he has also contributed to other books on Irish Traditional music. He has made various albums, his most recent recording being The Living Stream with Jackie Daly. He is an authority on the music of Sliabh Luachra, and received a PhD from the University of Limerick for his study on the fiddle–playing tradition of this region. A long–time consultant for the Geantraí series on TG4, he has also been an advisor to the Arts Council Deis scheme for the Traditional arts, and has served on the board of the Irish Traditional Music Archive (2007–2010). In 2003, he received the Hall of Fame Award from University College Cork where he currently teaches a number of courses in Irish Traditional music. Pierre Crépillon is a teacher of Traditional music (bombarde, flute and clarinet) within the French system of music–teacher training at the Conservatoire de Rennes in Brittany. He is a founder–member of Dastum, the Breton equivalent of the Irish Traditional Music Archive. Johanne Devlin Trew, PhD, is lecturer in the School of Criminology, Politics & Social Policy, University of Ulster. Previously she held teaching and research posts in Irish history at the University of Ulster, Magee and Queen’s University Belfast, in folklore at Memorial University of Newfoundland, and in Irish studies at Concordia University, Montreal. She is the author of Leaving the North: Migration, Conflict and Society, Northern Ireland, 1921–2011 (Liverpool UP, 2013) and Place, Culture and Community: the Irish Heritage of the Ottawa Valley (CSP, 2009). Her principal research is in migration and Diaspora studies, but she maintains a strong interest in the history, politics and cultures of Ireland, Québec and Newfoundland. Aileen Dillane is an ethnomusicologist and Irish Traditional musician based in the Irish World Academy, University of Limerick. She received her PhD from the University of Chicago where she was a Fulbright Scholar and Century Fellow. With interests in critical and cultural theory and ethnomusicological theory and practice, her work engages with Traditional/Vernacular/Popular musics of Ireland, North America, and Australia, in particular, in terms of performed identity, nostalgia and cultural intimacy, and the interrelationship between music and emotion. She co–edited Morrissey: Fandom, Representations, Identities (2011) with Devereux and Power, and is currently co–editing a book on David Bowie, as well as preparing a monograph based on her Irish music fieldwork experiences in Chicago. More recent research projects include Limerick Soundscapes, an interactive, ethnographic–based mapping of the music/sounds of Limerick and its citizens; Songs of Social Protest which looks at contemporary, counter–hegemonic Irish singer–songwriters; and ‘It Found Me’: The Place of Song in Elderly Residential Care which explores the powerful role of localised and tailored music performances in changing communities and cultures of care. She is a member of the 2010 All–Ireland winning Templeglantine Céilí Band and performs regularly on flute and piano/keyboards. Liz Doherty comes from Buncrana, Co. Donegal. She was taught fiddle by local music and dance master Dinny McLaughlin, and her 1996 PhD research was on the Cape Breton fiddle tradition. From 1994–2000 she lectured in Irish Traditional music at UCC, and in 2007 was appointed Irish Traditional music lecturer at UU, Derry. She has also held visiting and guest lectureships at RSAMD, Scotland, La Coruna, Spain, and National University of Australia, Canberra. In 2001 she was appointed Edwards Distinguished Visiting Professor of the Arts, Marshall University, West Virginia, USA. As a Traditional Arts consultant she has worked on projects with Irish local authorities and with European organisations. From 2005–08 she was the Traditional Arts consultant with the Arts Council of Ireland, responsible for setting up funding schemes, was a member of the board of the Irish Traditional Music Archive 1994–7 and of TG4’s Gradam Ceoil panel (2005–9). Elected chair of ICTM (Ireland) in 2009, her publications include Dinny McLaughlin – From Barefoot Days: A Life of Music, Song and Dance in Inishowen (2005); Crosbhealach an Cheoil/The Crossroads Conference 1996 (co–editor, 1999); Companion to Irish Traditional Music (major contributor, 1999 and 2011). As a fiddle player she has performed and recorded with Nomos, the Bumblebees and Fiddlesticks. Known for her strong Scottish and Cape Breton influences, she has two solo albums – Last Orders (1999) and Quare Imagination (2002). In 2012 she was the Director and organiser of the North Atlantic Fiddle Convention’s biennial fiddle showcase centred on University of Ulster at Derry City. A board member of the Irish Traditional Music Archive since 2010, she is a lead researcher on the Safe Trad project and is currently compiling an encyclopedia of Cape Breton Music. Martin Dowling is a historian, sociologist, fiddle player and lecturer in Irish Traditional Music in the School of Music and Sonic Arts at Queen’s University, Belfast. He has performed internationally and recorded with his wife, flute player and singer Christine; he teaches fiddle at Scoil Samhraidh Willie Clancy and the South Sligo Summer School and at festivals and workshops in Europe and the USA. From 1998 –2004 he was Traditional Arts Officer in the Arts Council of Northern Ireland. Author of Tenant Right and Agrarian Society in Ulster, 1600–1870 (Irish Academic Press, 1999), he has held postdoctoral fellowships in Queen’s and University College Dublin. His recent publications include ‘Fiddling for Outcomes: Traditional Music, Social Capital, and Arts Policy in Northern Ireland’ (International Journal of Cultural Policy, vol. 14, no 2 [May, 2008]); ‘”Thought–Tormented Music”: Joyce and the Music of the Irish Revival’ (James Joyce Quarterly, vol. 44, no. 1 ); and ‘Rambling in the Field of Modern Identity: Some Speculations on Irish Traditional Music’ (pp. 109–136, Radharc: a Journal of Irish and Irish–American Studies, vols. 5–7 [2004–2006]). He is currently working on a monograph history of Irish Traditional music from the death of harpist–composer Turlough Carolan (1738) to the first performance of Riverdance (1994). Janet Harbison is a harper, composer, teacher and stage producer. Born in Dublin, she started on piano at five and was playing for céilís in the Ring Gaeltacht college by the age of ten. She studied the harp at Sion Hill school and won the major harp competitions between 1979 and ‘81: the Feis Ceoil, the All–Ireland Fleadh, the Granard and O’Carolan Harp Festivals, the Oireachtas as well as international events. She was the first harper to tour internationally with CCÉ from 1980, and she researched the music of the Bunting collection at UCC and QUB. From 1986 to 1994 she was Curator of Music at the Ulster Folk Museum in Co. Down during which time she was involved in GCSE Traditional music curriculum consultation, and, in 1992, she organised and directed a year of festivities commemorating the Belfast Harpers’ bicentenary. She also set up numerous harp initiatives including Clárseoirí na hÉireann in 1987 and the Belfast Harp Orchestra in 1992. A Grammy Award winner with The Chieftains in 1993 and the Harp Foundation in 1994, she led a variety of harp, peace and cultural initiatives up to 2002 when she set up The Irish Harp Centre at Castleconnell, Co. Limerick, and the Irish and National Harp Orchestras (professional and youth training orchestras). Her numerous publications and recordings include six volumes of a harp tutor, original solos and orchestral scores, session tunes and Carolan and slow airs collections. Caoimhín Mac Aoidh is a founder member of Cairdeas na bhFidiléirí and continues with it as an active Committee member. He is directly involved in the coordination of both the Donegal Fiddlers Summer School in Glencolmcille and the Annual Fiddlers’ Gathering in Glenties, as well as numerous teaching workshops throughout the year. As a fiddle player he has both performed and taught extensively. He has written on collector Francis O’Neill’s associate, James O’Neill (The Scribe, 2006), but is noted for his commentary on the Donegal fiddle tradition with Between the Jigs and the Reels (1994), several papers on educational themes, three tutors on Donegal fiddle playing, and two collections of Donegal tunes, From Mazovia to Meenbanad: The Donegal Mazurkas (2008) and From Dunkeld to Dunkineely: the Highlands and Strathspeys of Donegal (2011). Séamus Mac Mathúna is a musician and singer. He has been Timire Ceoil of CCÉ since 1969, and has been involved at all levels of that organisation since the late 1950s. A highly respected flute player, he has a particular appreciation of the music of his native West Clare, the South–Sligo style of flute–playing, and the tunes and styles of Sliabh Luachra. In recent years he has been more prominent in Traditional singing and amhránaíocht ar an sean nós, with a detailed understanding of both traditions. The scope of his position in CCÉ, combined with his personal appreciation, input, and commitment to Irish music and singing, establish him as a significant contributor to the growth and development of Irish musical heritage. Karen Marshalsay is a master of the traditional Scottish harp, and as a specialist on all three of its forms – the wire– and gut–strung models, and the baroque bray harp with its buzzing sitar effect – she has performed throughout the UK and in Europe, America and Australia. She played with Allan MacDonald on the Edinburgh International Festival’s pibroch series and in the multicultural Yatra project. As a composer she has produced new works for the Celtic Connections festival’s New Voices series and the Distil showcase concerts for the Scottish Traditional Music Trust, and as Marsharp Music she has published her own series of harp music books. An experienced tutor, she has taught at Feisean, harp festivals and on short courses at Sabhal Mór Ostaig, Skye, she was clarsach tutor for seven years at the National Centre of Excellence in Traditional Music at Plockton, has lectured on Scottish music and taught wire and bray harp on the BA (Scottish Music) course at the RSAMD and she was learning officer for that institution’s HOTBED project [karenmarshalsay.com]. Anthony McCann is a consultant, facilitator, and researcher. He specialises in the provision of Continuing Professional Development in education, healthcare, arts, business, and heritage sectors. An ethnomusicologist, folklorist, and social theorist, he has worked as a lecturer and researcher at the University of California, the University of Sheffield, Sheffield Hallam University, and the University of Ulster. He is a Research Associate with the Smithsonian Center for Folklife and Cultural Heritage, a Visiting Fellow with the University of Bristol’s Graduate School of Education, and an Associate of the Center for Emergent Diplomacy, Santa Fe [anthonymccann.com]. Marie McCarthy is Professor of Music Education at the University of Michigan. Prior to this position, she was on the faculty of the University of Maryland from 1990 to 2006. She teaches courses on general music, music cultures in the classroom, and research methods in music education. Her research interests include the historical foundations of music education, the transmission of music process cross culturally, and children’s spirituality and arts education. She has written numerous book chapters, serves on the editorial boards of several journals, and has published in journals such as the Journal of Historical Research in Music Education, International Journal of Music Education, and the Journal of Research in Music Education. Her publications also include two books, Passing It On: The Transmission of Music in Irish Culture, and Toward a Global Community: A History of the International Society for Music Education, 1953–2003. She lectures internationally, most recently at the Grieg Research School in Bergen, Norway, the Lithuanian University of Educational Sciences, and Guangzhou University, China. McCarthy served as National Chair of the History Special Research Interest Group of the National Association for Music Education, and Chair of the History Standing Committee of the International Society for Music Education. Paul McGettrick is a lecturer in Music and Music Technology at Dundalk Institute of Technology. He has designed and taught degree courses and modules in Irish Traditional Music at Dublin City University, Dublin Institute of Technology, and Dundalk Institute of Technology. A flute player, he is Associate Editor of Sources of Irish Traditional Music c. 1600–1855 (Garland Academic Press, 1998). Mel Mercier is a composer, performer, academic and teacher, now Head of the School of Music and Theatre, University College Cork, where he lectures on Irish, African, Indian and Indonesian musics. He has performed and collaborated with pianist and composer Mícheál Ó Súilleabháin for over twenty–five years and throughout the 1980s he performed in Europe and the USA with John Cage and the Merce Cunningham Dance Company (Roaratorio, Inlets, Duets). He has also performed and recorded with many of the leading Irish Traditional musicians and has presented bodhrán and bones workshops in the USA and Europe for more than twenty–five years. As a composer he works regularly with theatre director Deborah Warner and actor Fiona Shaw. Recent compositions for the theatre include: Sétanta (Fibín and Abbey Theatre) – Irish Times Theatre Award nomination; School for Scandal (Barbican/Holland Festival) The East Pier/The Passing (Abbey Theatre); Mother Courage (NT London); Happy Days (NT, London/Greece/Paris/Madrid/New York/Amsterdam/Abbey Theatre). Recent installation work includes From the Sources (2010) at the Glucksman Gallery, University College Cork, which featured multiple simultaneous projections of film footage featuring performances by 100 Irish Folk musicians of almost 1000 17th– and 18th–century Traditional tunes. He is the director of the FUAIM Music at UCC event series and a co–founder of the Cork–based, intercultural music ensemble TRASNA. He is the Director of the UCC Javanese gamelan Nyai Sekar Madu Sari and the project leader on the Henebry/O’Neill wax cylinder digitisation project at UCC. Jo Miller grew up in Galloway, and trained at the Royal Scottish Academy of Music and Drama (RSAMD), Glasgow University and The School of Scottish Studies, Edinburgh; her post–graduate research focused on the musical life of her home area’s rural community. A singer and fiddler, she has taught Traditional music widely, both in the community and in formal education. She created the BA (Scottish Music) degree at RSAMD in 1996, now concentrating on the development of community and pedagogical issues, and has developed resources and run in–service courses on Traditional music for schools. She was on the Steering Committee for the Scottish Arts Council’s report Traditional Music in Scotland and contributed also to What’s Going On? A National Audit of Youth Music in Scotland (Scottish Arts Council, 2003). Colette Moloney is an academic and musician in both the Classical and Traditional idioms. A music graduate of University College Cork and the Cork School of Music, she gained her PhD from the University of Limerick in 1995. Her reference book, The Irish Music Manuscripts of Edward Bunting (1773–1843): An Introduction and Catalogue, was published by the Irish Traditional Music Archive in 2001, and was followed by The ‘Boss’ Murphy Musical Legacy in 2004. She is currently Assistant Registrar at the Waterford Institute of Technology. John Moulden is a life–time singer and student of Traditional song who has published and lectured widely since the 1960s. A former teacher in Controlled (Northern Ireland State) Schools, in 2003 he retired from his last post as principal of an Integrated School. His main concerns are to make songs available to those who value them and to make accessible, to singers and others, rigorously researched information about the song tradition and about songs. He is best known for his work on the Sam Henry song collection and The Traditional Music Song Pack. In 2006 he was conferred with a PhD for a thesis entitled The Printed Ballad in Ireland: a guide to the popular printing of songs in Ireland, 1760–1920. Subsequently he held a Marie Curie Post–doctoral Fellowship at NUI Galway and has lived since 2009 in Co. Donegal. Tom Munnelly (1944–2007) was a song collector, archivist and singer. Born in Dublin, this prolific and dedicated field worker made Traditional song his life and uniquely marked its society. With an intense interest in song and folklore he emerged from no academic background to produce by 1998 a prodigious volume of research, analysis and presentation. Beginning in 1964 he recorded Traditional song in the field, from 1969 to 1971 he was research assistant to D.K. Wilgus, Professor of Anglo/American Folksong, UCLA, noting, cataloguing and describing narrative song materials (English and macaronic) in the Main Manuscript Collection of the Irish Folklore Commission. In 1970, with Breandán Breathnach, Prof. Seóirse Bodley and Dr Hugh Shields, he founded the Folk Music Society of Ireland (Cumann Cheoil Tíre Éireann) and served on its committee. In 1971 he became the first song collector for the new National Traditional Music Collecting Scheme then initiated by the Department of Education under Breandán Breathnach. In 1975 this merged with the Department of Irish Folklore at UCD, so leading him to lecturing on Traditional song. In 1976, at the request of the Smithsonian Institute, he selected the twenty–five Traditional performers to represent Ireland in the American Bicentennial celebrations, and was the country’s spokesperson and lecturer there. In 1978 he moved to Co. Clare, and from then until 1991 was chairman of the Willie Clancy Summer School. In 1981 he was appointed to the Arts Council’s Irish Traditional Music Archive Advisory Committee. In 1982 he founded An Cumann le Béaloideas agus Ceol Tíre an Chláir (The Folklore and Folkmusic Society of Clare), organising its lectures over nine years. Between 1983 and 1985 he was the Arts Council nominee to the board of Mid–West Arts, and in the same year, with Dr Hugh Shields of TCD and Nicholas Carolan organised the fifteenth International Ballad Conference of the Kommisssion fur Volksdichtung (Société Internationale d’Ethnologie et de Folklore). From 1985 to 1988 he was a member of the Arts Council of Ireland and from 1988 to 1993 was chairman of the Irish Traditional Music Archive (re–elected to its board 1995 and 1998). In 1990 he was chairman/founder of the Ennistymon Festival of Traditional Singing, remaining a key figure in it until 2002, and also in 1990 he was chairman/founder of Scoil Leacht Uí Chonchúir (Lahinch Folklore School). Between 1990 and 1994 he indexed all oral poetry (lyric and narrative, English and macaronic) in the first 2,000 vols. of the Main Manuscript Collection of the Department of Irish Folklore. His recording after 1971 represents the largest and most comprehensive collection of Traditional song ever compiled in Ireland by any one individual. He lectured widely on Folk music and folklore in Ireland, spoke in all Irish universities, and gave many papers abroad. He was celebrated in a festschrift Dear Far–Voiced Veteran – Essays in Honour of Tom Munnelly (which contains a detailed résumé of his work), and was honoured with a honorary DLitt from National University of Ireland, Galway, in 2007. Bob Newton teaches and lectures on the musical traditions of the Celtic world to Traditional and non–Traditional students and general audiences. He received his PhD from the University of Wisconsin–Madison based on two years of research in Mali, West Africa working with the local musicians and bards on contemporary performances of their epic. He has explored and performed Traditional music of several Celtic nations over the past thirty–five years. He recently revised the online course for which he is the instructor, now entitled Celtic Musical Traditions, for the University of Wisconsin. Siobhán Ni Chonaráin is a teacher and flute player from Co. Limerick. She has contributed to most of Comhaltas Ceoltóirí Éireann’s educational activities in a voluntary capacity for almost twenty years and is continually active in the teaching and playing of Irish Traditional music nationally and internationally. Frode Nyvold was born in Trondheim, Norway and acquired his degree (Cand. Polit.) in Social Anthropology from Oslo University in 1979. He has been an Associate professor at the Department of Folk Art and Folk Music, Telemark University College since 1986. His fieldwork has been on Norwegian Traditional music, and also on musics in France and Hungary. His main themes in practical and theoretical work have been identity and communication. A singer of Traditional songs since the 1960s, he has performed these in Norway and abroad and was nominated to the Norwegian Grammy award for the CD Skjemt og sjanti. He is currently working with musicians Ånon Egeland and Leiv Solberg and sings with the French/English/Norwegian group Five Men in a Boat with whom he has also recorded. Frode Nyvold was the coordinator of the NORDPLUS network of higher education in Folk music – NORDTRAD, for third–level institutions in Scandinavia and the Baltics – between 1999 and 2009. Jimmy O’Brien Moran is an uilleann pipes and saxophone player, lecturer and researcher. Born in Waterford, he took up uilleann pipes at seventeen, learning first from Tommy Kearney, and later from Pat Mitchell at the Willie Clancy Summer School. He taught at the latter after 1977 for several years, then learned saxophone in 1979 when he joined the band Scullion with which he played for a year, touring and recording. He has played and taught in various parts of the world, including North America, New Zealand and Europe. He first recorded in 1978 on an album of young pipers entitled The Piper’s Rock, then in 1996 produced a CD of solo piping Sean Reid’s Favourite. He studied music in WIT (then WRTC), completing a BA in 1992, going on to lecture there for a number of years. His PhD research at UL concerned the 19th century Galway piper Paddy Conneely, and he was a visiting Fulbright scholar at Boston College in 2008. An occasional contributor to the bulletin of Na Píobairí Uilleann and the journal of the Sean Reid Society, he lectures and teaches at third level and at summer schools and tionóil in Ireland and abroad. Conal Ó Gráda is a flute player and teacher from Cork. A multiple All–Ireland prize winner in his youth, he is at the forefront of Traditional Irish flute–playing and is one of its most distinctive voices – a highly personal style which is rhythmically strong and has an earthy tone reminiscent of saxophone. His debut 1990 album The Top of Coom remains a seminal stylistic recording of flute–playing and is matched by his critically acclaimed 2008 solo Cnoc Buí. He teaches flute privately in Co. Cork and at Scoil Samhraidh Willie Clancy and Blas; he has taught internationally too, including at the Catskills Irish Arts Week. A co–founder of the Banna Fliúit Loch a’Bhogaigh (a flute band), he is chair of the Traditional flute festival Cruinniú na bhFliúit / the Flute Meeting which runs annually in Baile Bhúirne, Co. Cork. A member of the band The Raw Bar Collective, he recorded Millhouse Measure with them in 2011, and in 2012 published An Fheadóg Mhór a book on flute technique and styles [conalograda.com]. Muiris Ó Rócháin (1944–2011) was born to a bi–lingual Gaeltacht family in Dingle, Co. Kerry. His involvement in his younger years with music, song and local traditions such as the wren gave him a life long interest in Traditional music and culture, and he went on to collect folklore for UCD from the last of the Gaelic storytellers while teaching in Cahersiveen and Waterville, and was involved in setting up Ballinskelligs Local Development Co–op in 1968. He taught in Dublin from 1967 where he was an associate of Breandán Breathnach, John Kelly and other major figures in the Traditional music revival. He moved to Miltown Malbay, Co. Clare in 1970 and taught at Spanish Point. He contributed to CCÉ’s Treoir magazine, was involved in Dal gCais magazine from its inception, and played a leading part in the making of three short films – My Own Place (RTÉ, 1980, prod. Tony MacMahon), Cur agus Cúiteamh (RTÉ, 1990, prod. Cathal Goan), Up Sráid Eoin – The Story of the Dingle Wren (RTÉ, 1991, prod. Ríonach Uí Ógáin). The original proposer of the Willie Clancy Summer School, he drew up its first programme in 1973 with Séamus MacMathúna of CCÉ and was its director up until the time of his death. In 2005 he organised and directed a summer school for Irish music in Cape Breton and in this decade received numerous awards for his contribution to Traditional music, most notably TG4’s Gradam na gCeoltóirí in 2010. Stan Reeves plays button box in a dance band. He has worked for 30 years in Community Development and has integrated the methods of Paulo Freire into the teaching practice of the Adult Learning Project and the Scots Music Group. He founded the Scots Music Group, the Youth Gatherin, and the Scots Fiddle Festival, alongside volunteers from the community. He is the author of ‘If I can’t dance it’s not my revolution’ in Papers from the Fourth International Conference on Adult Education and the Arts (1995). Tes Slominski is a fiddle player, teacher, and writer who founded the (non–profit) Blue Ridge Irish Music School in Charlottesville, Virginia in 1999 and served as its first executive director. Following CC 2003 she earned her PhD in ethnomusicology from New York University, and she currently teaches in the music department at Beloit College, Wisconsin. Her research focuses on gender, social class, and nationalism in Irish Traditional music – from the musicians who performed at Gaelic League events in the early twentieth century to issues of sexuality in the Traditional music scene today. A book based on this research is planned, and her article, ‘Clever Young Artistes and The Queen of Irish Fiddlers: Intelligibility, Gender, and the Irish Nationalist Imagination’, will appear in an upcoming issue of Ethnomusicology Ireland. In addition to her scholarly work, she is an active performer and fiddle teacher who specialises in the repertoire and style of Sliabh Luachra. Thérèse Smith is a BA and BMus graduate of University College, Dublin. She has lectured at Brown University and Bowdoin College in the USA and, since 1991, at University College Dublin where she is Associate Professor of Music. Trained as an ethnomusicologist at Brown University (MA and PhD), she has given guest lectures at a variety of USA universities as well as throughout Ireland, and in Europe. Specialising in Irish Traditional music and African American music, she has published widely both in Ireland and internationally, her major works including: “Let the Church Sing!”: Music and Worship in a Black Mississippi Community (University of Rochester Press), Ancestral Imprints: Histories of Irish Traditional Music and Dance, ed. (Cork University Press), Moving in the Spirit : Worship through Music in Clear Creek, Mississippi (documentary LP recording), Blas: the Local Accent in Traditional Irish Music (edited with Mícheál Ó Súilleabháin), and Éigse Cheol Tíre vols. V–VI (with Hugh Shields and Nicholas Carolan). Her current research is focused on the English–language song collection of the late Tom Munnelly, and the effects of digital technology on worship in Clear Creek, Mississippi. Sally Sommers Smith (Wells) is Associate Professor of Natural Science at Boston University and Lecturer in Biological Sciences at Wellesley College. She is also a fiddler in the Irish and Cape Breton traditions, and has published widely on evolution of Traditional music in North America. Her current research interests include the tracking of rapid repertoire change in the Traditional music of Cape Breton. She makes her home in Kennebunk, Maine, where she lives with her husband, the well–known American fiddle scholar and archivist Paul Wells. Gunnar Stubseid is a performer on and teacher of the Hardanger fiddle. From the southern part of Norway, an area famous for its rich Folk music traditions, he began playing at the age of 15, learning from old Traditional fiddlers. He has performed in concerts in Norway and internationally – notably in the Folk music groups Slinkombas and Setesdalarna, and with the Swedish multi–musician Ale Møller – and has made recordings both as a soloist and studio musician. Educated as a music teacher, he went on to study Ethnology at the University of Bergen and was appointed performance director of the Ole Bull Academy at Voss from 2003–2012. He has written papers, articles and books on Norwegian Folk music, and as a teacher and lecturer has introduced many people to not only the Folk music of Norway, but also to the distinctive Folk music of his home region of Setesdal. His awards include the Norwegian Grammy award (Spellmannsprisen), The Ole Bull Medal, The County of Bygland Cultural Prize and The Hilmar Alexandersen Memorial Prize. Eithne Vallely is a fiddle player and teacher originally from Lifford, Co. Donegal. A founder–member of the Armagh Pipers’ Club, since the early 1970s she has been involved with its publication of a range of teaching materials on Irish Traditional music, including tutor books for tin whistle, fiddle & uilleann pipes as well as children’s song collections. From a long line of Traditional fiddlers on both sides of her family, she learned to play at a young age and has been teaching traditional music with APC since 1969. She has taught music at every level from pre–school to third level, was Head of Creative Arts in St. Patrick’s Grammar School, Armagh and lectured in St. Patrick’s College of Education Dublin. A member of the consultation group which drew up the Northern Ireland Music Curriculum, she has given in–service courses for teachers, has a particular interest in Early Years Music Education, in collaboration with pipe and brass bands, in new music commissioned by APC, and she is involved in setting up music links between Armagh Pipers Club and young musicians from Scotland and Germany. She and Brian have received many public commendations for their work, including the Bass Charrington Award (1974), Gradam Sheáin Uí Bhaoill (1983), the Celtic Fusion award (2008) and Gradam Ceoil TG4 in 2012. Fintan Vallely is a musician, writer, lecturer and researcher on Traditional music. From Co. Armagh, he has taught flute at the Willie Clancy summer school in Co. Clare since 1986, and in that year was the author of the first tutor for Irish flute. A commentator on Traditional music, he has been writing about it since 1990, and lecturing on it at the National University of Ireland, Maynooth, University of Ulster, Trinity College Dublin, Dundalk Institute of Technology and in the USA. He began to play Traditional music in the early 1960s, later studying horticulture at University College Dublin, then ethnomusicology at Queens University Belfast. He was The Irish Times’ Traditional music correspondent and reviewer from 1994–2000, was columnist in that field with The Sunday Tribune 1996–2002, and was consultant editor for Traditional music to The Encyclopedia of Ireland (2003). His published work includes The Blooming Meadows (with Charlie Piggott and photographer Nutan Jacques Piraprez, 1998), Together in Time (a biography of Antrim flute player John Kennedy, 2002), and a major reference work, the edited, A–Z Companion to Irish Traditional Music (1999, expanded and revised 2011; digital formats, 2013). His writing also covers social and political issues in music: Tuned Out (2008) is his main researched work, and his satirical song collection Sing Up! takes this into the realm of humour (2008). He played full time in the 1970s and ’80s, in the USA, Scotland and England, and has flute and song recordings with guitarist Mark Simos and singer Tim Lyons. A contributor to conferences and journals on Traditional music, he was an initiating organiser of the Crosbhealach an Cheoil conferences (1996 and 2003). His PhD research – Flute Routes to 21st Century Ireland – concerned the entry of the flute in Ireland, and his work since includes investigation of the origins of the bodhrán. His recent published work includes the ethnographic Ben Lennon – the Tailor’s Twist (2011, with Jacques Piraprez and graphic designer Martin Gaffney) and the 2013 flute tutor The Complete Guide to Learning the Irish Flute [imusic.ie]. Desi Wilkinson is a performer, researcher and teacher. Originally from Belfast, he is a singer and multi instrumentalist. As a professional musician he has worked and toured widely with internationally known artists and groups from the Traditional and Folk music worlds. From 1992–’94 he lived in Brittany, learning, playing and studying Breton music (The social world of Breton music is the title of his PhD thesis) which informs research for his book on the dance music of Brittany (forthcoming 2013). He has four albums with his band Cran, two solo CDs, and the experimental Buffalo in the Castle, an exploration of American old time and Irish music (2009). He has lectured at University of Limerick, in France and in Canada, and has contributed many papers to seminars and conferences. Currently he teaches performance and ethnomusicology at the International Centre for Music Studies (ICUS) at Newcastle University, England. Cinzia Yates–Curtis plays whistle and is a teacher of Traditional Manx music. A dancer and occasional ceilidh caller for many years, she first studied Classical music (clarinet and singing ) before branching into Ethnomusicology with an MA at UL specialising in Manx and Celtic music and dance. She worked with the Manx Heritage Foundation as Music Resource Coordinator on its Manx music database, a position which developed into that of Manx Music Development Officer with a team working to create new music resources and promote Traditional music and dance on and off the Isle of Man. She completed a second MA in Manx Studies at Liverpool, was director of the Manx inter–Celtic festival Yn Chruinnaght, acted on the Shennaghys Jiu festival committee and was delegate and pavilion manager for the Isle of Man at Lorient’s Festival Interceltique. Her PhD research at Cardiff University focuses on canon formation in Manx Traditional music.